Visitors to the 2013 Shanghai Auto Show will get a glimpse of the future design direction of Volkswagen SUVs, in the shape of the CrossBlue Coupé. 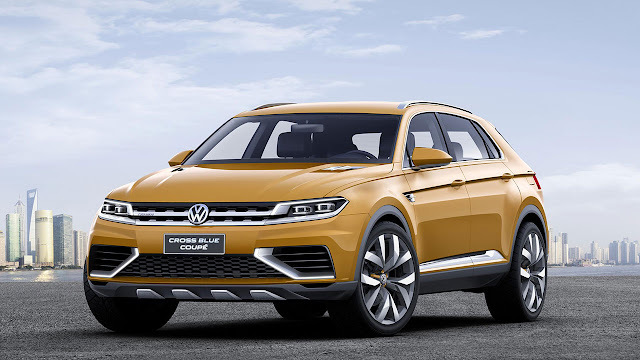 The five-seat CrossBlue Coupé is 4,889 mm long, 2,015 mm wide and just 1,679 mm high: dimensions that give it a low-profile, wide appearance (for comparison, Touareg: 4,795 / 1,940 / 1,732). 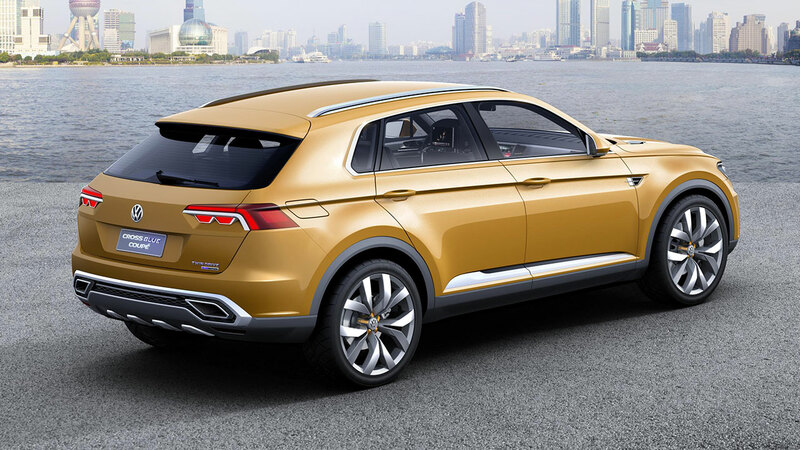 Factor in the wide track (1,709 mm front, 1,726 mm rear), 2,980 mm wheelbase (Touareg 2,893) and 22-inch alloy wheels (with 285/44 tyres) and you have a car with a distinctively muscular and sporty appearance. 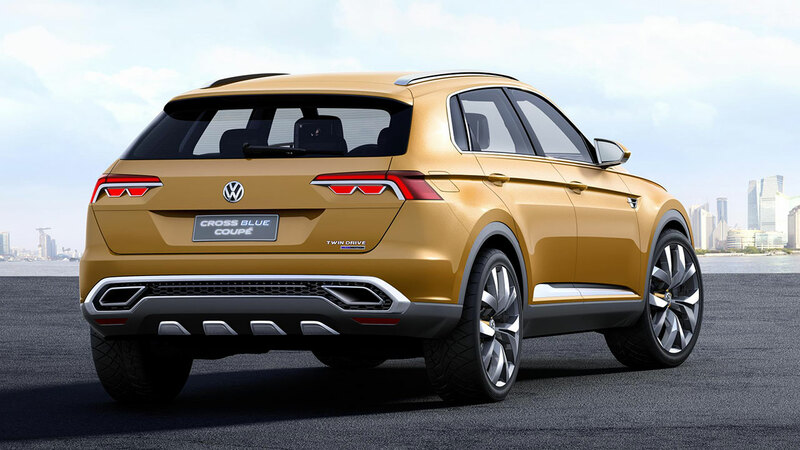 At the front, the radiator grille trim – consisting of two polished aluminium struts and the VW logo – is a 3D element extending into the headlights. The lateral ends of the upper strut are used for the daytime running lights, creating a distinctive light signature. Along the side – under the steeply raked C-pillars – the ports for the fuel tank and battery were uniformly integrated into the design of the CrossBlue Coupé. 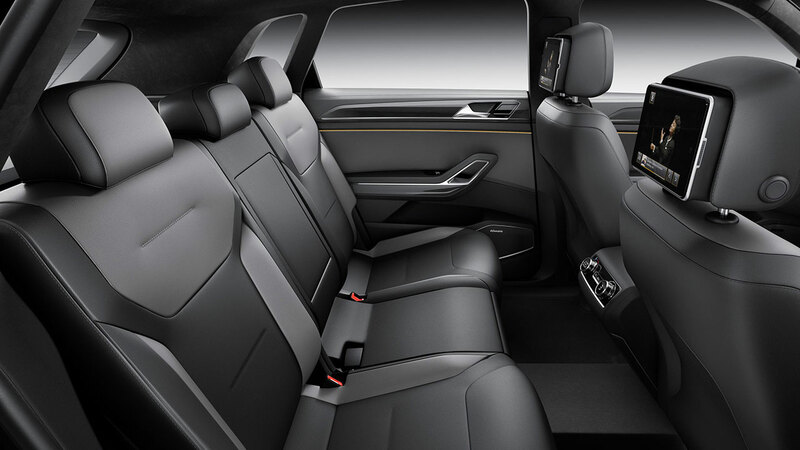 As is usual with Volkswagen, the fuel filler neck is located under a lid on the right side of the vehicle, while the cover for the electrical outlet is located symmetrically on the left side. 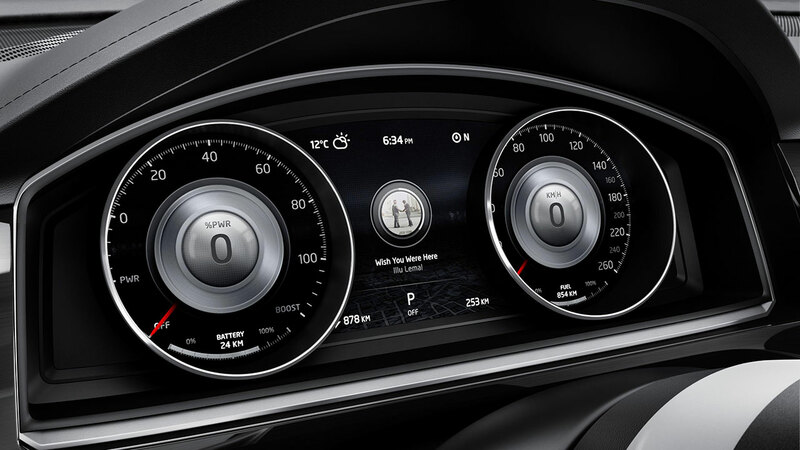 It consists of one socket for charging the high-voltage battery and another for connecting electric devices; this interface (16 A, 230 V) makes the CrossBlue Coupé a generator, too. The prominent tailpipes are designed in stainless steel, and are integrated into a polished aluminium trim panel that runs horizontally along the back of the coupé. Beneath this is a rugged anthracite-coloured area, in which a stainless steel underbody protection panel has been designed, like at the front end. The boot lid opens and closes electrically, revealing a load space that can hold up to 1,101 litres of luggage (or 537 litres with all seats upright). As well showcasing the future for Volkswagen design, the CrossBlue Coupé also highlights future drivetrain possibilities, in this case a plug-in hybrid system consisting of a V6 turbocharged direct injection petrol engine and two electric motors (40 kW front and 85 kW rear), together producing up to 415 PS (305 kW). Via a six-speed DSG gearbox, that power enables this 4,889 mm-long SUV to accelerate like a sports car: zero to 62 mph takes a mere 5.9 seconds, and the top speed is 146 mph. Even with this level of performance, fuel economy is impressive with a combined cycle figure of 3.0 l/100 km, or 94.1 mpg. In hybrid mode, with a depleted battery powered by the TSI engine, the CrossBlue Coupé returns 6.9 l/100 km (40.9 mpg). This efficiency gives the CrossBlue Coupé, with its 80-litre fuel tank, a theoretical range of 1,190 km (740 miles). The CrossBlue Coupé is based on Volkswagen’s new Modular Transverse Matrix (MQB) components set. This would give any production version a large amount of flexibility when it comes to potential power: conventional drive systems with four- or six-cylinder engines could also be used, configured for a variety of fuels (petrol, diesel, CNG). The TSI engine produces 500 Nm (368 lbs ft) from just 1,800 rpm, while the electric motors produce their torque – 180 Nm (133 lbs ft) at the front and 270 Nm (199 lbs ft) at the rear – immediately. Combined, the system can produce up to 700 Nm (516 lbs ft). Powered by its battery alone, the CrossBlue can cover up to 33 km/20 miles as an EV. In E-mode, only the rear electric motor propels the vehicle and the TSI engine is shut off and decoupled. At up to 75 mph, the engine is not engaged as long as the battery has sufficient charge. As soon as there is a need for TSI power, it is coupled to the drivetrain again, within fractions of a second. The battery can be charged by external power sources or by the engine while the vehicle is moving. The driver can switch to a charging mode by pressing a button on the centre console. The TSI engine charges the battery while driving to store enough electrical energy for EV operation later in the journey, for instance in an urban area. There are also a number of other modes, as detailed below. Coasting: When the driver releases the accelerator pedal, the engine and electric motors are decoupled from the drivetrain, provided there is sufficient battery charge. Battery regeneration: When the accelerator is released or the brakes applied, the electric motors act as generators and feed energy recovered from the brakes into the battery. In this case, the TSI is also shut off and decoupled from the drivetrain. Boosting: When more performance is required, the electric motors form an alliance with the TSI engine known as ‘boosting’. In this mode, all four wheels are driven. Off-road(‘propshaft by wire’): All four wheels are driven. In this case the front electric motor (supplied with energy by the TSI engine) operates as a generator and a power source for the electric motor at the rear. TSI only: In this mode, the CrossBlue Coupé is a pure front-wheel-drive vehicle. There are no current plans for the CrossBlue Coupé to enter production.